The Global Accessible Awareness Day is today. The purpose of this day is to get people talking, thinking and learning about digital (web, software, mobile, etc.) accessibility and users with different disabilities. This is a really nice video to coincide with the event. It introduces digital accessibility, some reasons why digital inclusion is important, and tips to help you start making your digital technology more accessible, usable, and inclusive. Getting accessibility right means, you’ll build something that is better for everyone, and better for business! Tip 2: If you are using an online platform to create your website, use ‘accessible’ themes and plugins,and keep the following in mind. Tip 3: Design pages so that users may customise their experience of them – changing colours, the size of text, or buttons. Use responsive layouts that will work on different devices. Tip 4: Always let users know where they are and how they get to somewhere else. Create alternative routes to suit different requirements, like a ‘skip to main content’ link. Tip 5: Make sure that every action that can be performed using a mouse can be achieved using the keyboard alone. Keyboard only users need to see where they are at all times when they navigate using the TAB key, and tabbing should follow a logical order. Test how easy it is to navigate using only the TAB, ENTER, SPACE and ARROW keys. Tip 6: Give the user control – provide a pause button, and don’t set audio or video to play automatically. Tip 7: Choose a video player that allows you to add captions, and provide a text transcript, to make audio and video content accessible. Include descriptions of any important visual information as well as speech. Tip 8: If an image is important, contains text or is a link, explain this with ‘alternative text’ that screen reader software can read out to users with visual impairments. Tip 9: Is your text in easy-to-understand language? Use short, simple sentences to aid readability and engage a wider audience. Tip 10: Give each page a title, and organise the text using headings, paragraphs and lists. Add ‘mark up’ to enable easier navigation and explain features to people who can’t see them – this applies to documents in Word or PDFs as well as webpages. Tip 11: Make sure that links stand out clearly from surrounding text and let users know if the link will open in a new window or download a document. Links need to be concise and descriptive so that if they are read on their own, people will still know where they go. Tip 12: Test text and background colour combinations and contrast online to ensure text can be easily read by people who are colour-blind or have impaired vision. Tip 13: Give visitors time to extend their session if they wish. If your webpage ‘times out’ before people are able to complete forms, this can be a very frustrating experience. Tip 14: Explain accessibility improvements you’ve made and why, in an accessibility statement and provide easy ways for people to contact you if they are having difficulty. Tip 15: Please use alternatives [to CAPTCHA] – such as text-based logic problems, or simple human user confirmations. Spam protection like CAPTCHA may shut out potential customers not just spam robots. The Global Accessible Awareness Day this year is on the 21st of May. The purpose of this day is to get people talking, thinking and learning about digital (web, software, mobile, etc.) accessibility and users with different disabilities. 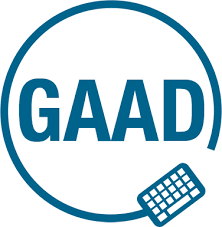 It’s an international event where organizations or anyone is invited to hold an in-person or a virtual event to mark GAAD and invite the public to take part? As well as the In-Person events there will be many free online accessibility courses and free webinars available.